The all-new Kindle has a new electronic-ink screen with 50 percent better contrast than any other e-reader, a new sleek design with a 21 percent smaller body while still keeping the same 6-inch-size reading area, and a 17 percent lighter weight at just 8.5 ounces. The new Kindle also offers 20 percent faster page turns, up to one month of battery life, double the storage to 3,500 books, built-in Wi-Fi, a graphite color option and more—all for only $139. I have owned a K2 for over a year now and have really loved it. However, when I saw the K3, (or next generation Kindle), was coming out and was able to find a few images and specs, I knew I wanted it. I ordered immediately and began the long wait. Graphite- Yes,really. I wanted something not white. I think the graphite looks better and cleaner. While skins are available, I found them to be a bit distracting so I'm very glad that Amazon gave us the choice to order white or graphite. Size- The K2 is actually nice but it seems a little big, especially in a case. I wanted something smaller and the K3 fits my hand perfectly. It's like it was designed around my hand that's how well it fits. "Previous Page" button on both coasts- I found this to be very important because it just feels right and it's necessary. See, there you are, in bed, all propped up on pillows, comfy, holding the Kindle in your right hand, reading, while your left hand dips in to the bag of Peanut M&Ms. You're reading along, engrossed in the story-you click the next page button and for whatever reason, miss something. "Wait, what? ", you say and you have to go back to the previous page to pick up that word you missed but now you have to take your hand OUT of your bag of chocolates to hit the previous page button and it disrupts the entire flow and pulls you out of your comfy little cocoon for a second. With the previous page button on the right hand side as well, you don't have to stop using your left hand to shove candy down your throat, stop petting the dog or cat, stop twisting your hair, you just continue on, reading, using one hand. The Kindle needed that button on the right side, they put it there, I could not be happier. Placement of "Home", "Menu" buttons- While I may be used to the K2's button placement, the K3's home and menu button are where I intuitively want to press. It makes more sense to me to have them by the keyboard. This is where the bulk of the function buttons are, why have them spread out all over the place? All in one little area. The 5 Way Controller- I am so happy with the new 5 way controller. The one on the K2 stresses me out. It's a little knob and I have been very anxious this entire time that I'm going to break it right off. This was really noticeable when I started building my collections because I had to use that controller button a lot. It took me probably twice as long as others because I was very careful touching that controller, delicately pushing it to the right or up/down. The 5 way controller on the K3 works well, more responsive to the touch and I'm less stressed. It may take some getting used to for some when using it to navigate up or down a page as the Menu and Home buttons are very close to those controls but for me, again, no problems. LOVE it. Contrast- Ok, I read all kinds of things about contrast when I first got my K2. I, luckily, never had a problem with my contrast. It always seemed dark to me and I never felt the need for a hack or to return mine because it was good. Or so I thought. When I got the K3, holy cow what a difference! The fonts are so much darker, crisper, so much easier to read. What an absolute pleasure! They still have the grayish background and when I compare the two, the background looks almost the same color. On the K3 it's just more...clear, really. In fact, when I put my K2 and my K3 next to each other, I marvel at how I ever thought my K2 had dark fonts. It looks faded, sun bleached, hard to read compared to the K3. When they said better contrast, they absolutely meant, better contrast. The K2 was already easy on my eyes but this contrast is even better for my eyes. It's hard to tell from photos, you really have to see it in person. Excellent job on this part. Beautiful. Wi-Fi- I ordered the 3G/Wi-Fi because I'm not always going to be home when using my Kindle. But I am so happy that they added wi-fi because this entire time, I've been mainly using the USB cord to do anything with the Kindle. I've had to shop on my computer, send the book to my Kindle, hook up the USB cord, drag it to my Kindle...and no, it's not hard but you know, sometimes I just don't feel like getting out of bed to get the laptop and the cord and set it all up. Sometimes, I just want to order the next book in the series without moving. Oh yes, the Kindle is spoiling me and now, having the wi-fi, I don't even have to MOVE at ALL to get another book! How grand is life? The set up was laughably easy. At first when it scanned for a hot spot it didn't detect mine but I don't take "no" for an answer so I made it look again. It found my signal, I put in the password and now I can shop around in the Kindle store like everyone else, I can get on the web, browse around and get my books in 60 seconds, (or less), like all the others. I didn't feel I had missed out on too much before with my K2 but now that I've been able to do this with the K3, I realize I have been missing a lot of the Kindle experience. Thank you, Amazon, for adding this feature. So those were the reasons I ordered this unit. As far as weight is concerned, I'll be honest that I don't really notice much of a difference. I do carry both in a case, maybe that has something to do with it but, seriously, they feel just about the same. Also, I don't mind the number keys not being on the keyboard. I never really used them anyway and it's a matter of hitting the "sym", (symbol), key to get the number menu. I guess if you like to jump around to different locations it might get old but I have discovered there are ways to get around that. (Find out which letters associate with those number keys and you don't have to use the symbol menu.) But again, for me, not a big deal. The previous/next page buttons are a little different but once again, these work perfectly for me because as I was reading on the K3, I noticed that I hit those keys towards the very edge anyway. I picked up my K2 just to test and yep, that's how I held the Kindle so I don't have to put any effort in to turning a page. And they are quiet. No more, "click"...read, read, read, "click", read, read, read, "click"...you can't hear them. And finally, page turns: I put my two Kindles next to each other and hit the "next page" buttons simultaneously and they both turn at pretty much the same speed. I really don't notice much difference there. Anyway, my K2, as I said, still works and I'm keeping the K2 but this K3 is stunning. It is glorious. I absolutely love it. I had enough time between ordering and receiving and I wondered if maybe I would send it back, maybe I could just keep using the K2, maybe I'm being a bit of a tech junkie...but that would be wrong. There is NO WAY I would send this thing back. It's absolutely wonderful. I love it. I absolutely LOVE the K3. I upgraded from a first-generation Kindle, and the difference is astounding! I love the new design. Smaller, lightweight, efficient. The display is crisp, and the refresh rate on the screen is extremely fast. I brought it in to work today and within thirty minutes my boss was on Amazon ordering one for himself! I had fought ebook readers for a while, despite the fact that my husband loves his Kindle 2. I felt like I was "betraying" books in some way. However, once the WiFi only, less expensive version came out, my husband was able to talk me into having him get me one for my birthday after I tried reading some on his Kindle. I love it! The setup on our home wireless network was simple (to be be fair, we are both in IT) and I was amazed at how quickly the books downloaded (seconds per book). I downloaded about 25 free classics and purchased 2 other books. I was worried about not being able to lose myself in a book as I am able to do in a paper book, but I find that I am just as engaged reading a Kindle book. I love the fact that I can organize the books into collections to make them easier to group and find. The light-weight portability is great and I am amazed at the thought of being able to carry up to 3500 books with me. The interface seems intuitive and is fairly responsive (page turns seem very responsive, menus less so). I don't understand why people are trying to compare this to an IPad and why they are "disappointed" that this cannot do as much; this is purely a reading device. If you want to do other things other than read books/documents, get another more multi-functional device. If you want something for reading, this seems to be a great product. I am very disappointed with this item. After just a few months the screen stopped working. It displays lines all over it. I called and explained this to Amazon, and they have agreed to replace it with a refurbished Kindle. Their response was "yes, the screen is a little more sensitive than we would like it to be, even jaring it too much may do this and it is also very sensitive to hot and cold". Amazon replaced the Kindle very easily and with no problem, however I am very disappointed that they would not replace it with a new Kindle so soon after purchase. The nice surprise was that you can search google - I didn't know you go to other sites (I live for Fan Fiction) and to see I can still get there for FREE..too cool. Yes it's a little slow and it's black and white but again FREE PEOPLE!!! The other surprise was the music! I really didn't look into all the options - I just wanted something to read from so all these extras are WONDERFUL!!! I've only owned it for a few hours but already in LOVE!!! Amazon designed Kindle to provide an exceptional reading experience. Thanks to electronic paper, a revolutionary new display technology, reading Kindle's screen is as sharp and natural as reading ink on paper - and nothing like the strain and glare of a computer screen. Kindle is also easy on the fingertips. It never becomes hot and is designed for ambidextrous use so both "lefties" and "righties" can read comfortably at any angle for long periods of time. Kindle was wanted to be completely mobile and simple to use for everyone, so it has been made wireless. No PC and no syncing needed. Using the same 3G network as advanced cellphones, Amazon delivers your content using its own wireless delivery system, Amazon Whispernet. Unlike WiFi, you'll never need to locate a hotspot. There are no confusing service plans, yearly contracts, or monthly wireless bills - Amazon takes care of the hassles so you can just read. With Whispernet, you can be anywhere, think of a book, and get it in one minute. Similarly, your content automatically comes to you, wherever you are. Newspaper subscriptions are delivered wirelessly each morning. Most magazines arrive before they hit newsstands. Haven't read the book for tomorrow night's book club? Get it in a minute. Finished your book in the airport? Download the sequel while you board the plane. Whether you're in the mood for something serious or hilarious, lighthearted or studious, Kindle delivers your spontaneous reading choices on demand. And because Amazon knows you can't judge a book by its cover, Kindle lets you download and read the beginning of books for free. This way, you can try it out - if you like it, simply buy and download with 1-Click, right from your Kindle, and continue reading. Want to try a newspaper as well? All newspaper subscriptions start with a risk-free two-week trial. Kindle's paperback size and expandable memory let you travel light with your library. With the freedom to download what you want, when you want, Amazon hopes you'll never again find yourself stuck without a great read. The good: Excellent high-contrast screen does a great job of simulating a printed page; large library of tens of thousands of e-books, newspapers, magazines, and blogs via Amazon's familiar online store; built-in free wireless "Whispernet" data network--no PC needed; built-in keyboard for notes; SD card expansion slot; compatible with Windows and Mac machines. The bad: Design is ergonomic, but not very elegant; pricing for nearly all the content seems too high, especially considering the periodicals and blogs are available for free online; black-and-white screen is fine for books, but less impressive for periodicals and Web content; lacks a true Web browser; included cover is clumsy and poorly designed; additional file formats need to be e-mailed to Amazon for conversion; yet another dedicated device you'll need to lug around with you. 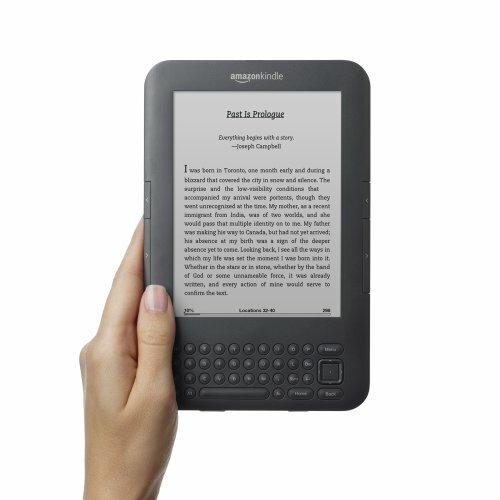 The bottom line: With its free built-in wireless capabilities and PC-free operation, Amazon's Kindle holds a distinct advantage over Sony's Reader and is a promising evolution of the electronic book--but Amazon needs to bring down the pricing for both the device and the content to attract a wider audience. 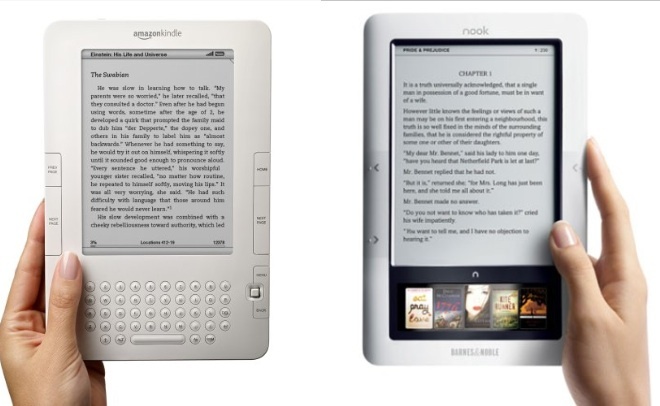 One of the screensavers for Amazon's $400 Kindle electronic book reader has a picture of an old printing machine and above it a message that reads: "Kindle is a whole new class of device. Thank you for being an early adopter. We'd love to get your input at: kindle-feedback [at] amazon.com." First off, while the Kindle may not be a whole new class of device (electronic-book readers have been around for a number of years), it joins the Sony Reader in making the e-book reader category a whole lot sexier and buzzworthy. While the Sony PRS-505 ($300) is the sleeker of the two devices, the Kindle is the more revolutionary in that it has a free built-in wireless connection that allows you to tap into Amazon's vast online bookstore from just about anywhere you can access Sprint's EVDO cellular data network. In many ways, the Kindle is similar to the Sony Reader. At 10.3 ounces, the Kindle weighs about an ounce more and is slightly bigger, measuring 7.5 inches high by 5.3 inches wide by 0.7 inch deep. But both devices have 4.9-by-3.6-inch (6-inch diagonal), 600 x 800-pixel screens that use E Ink technology, which serves to make the letters and words on the screen look more printlike in their appearance--it's quite impressive if you haven't seen the technology in action before. Technically, it's an electrophoretic display, which Wikipedia describes as "an information display that forms visible images by rearranging charged pigment particles using an applied electric field." The Kindle's screen has 4 scales of gray and 167 pixels per inch, while the Sony's has 8 scales of gray and 170 pixels per inch, which means the Sony offers a little more in the way of contrast and is slightly easier to read. The Kindle is about the size of a trade paperback book. One of the inherent downsides to E Ink technology is that the screen takes a second to refresh (it goes to black and essentially blinks) when you turn a page. Some may find this "ghosting" effect bothersome, but the Kindle's designers have done a good job limiting the delay so it isn't completely irritating and jarring. Also, considering you can read the screen in direct sunlight (think: beach chair), the trade-off seems worth it. The screen duplicates the sensation of reading a printed page. To be clear, Amazon (like Sony) opted against using a backlight, since it strains the eye. That means you'll need to use the Kindle in the same sort of well-lit environment that you'd read a normal book or magazine. The Kindle holds around 200 books in its 185 MB of user-accessible internal memory, and you can store hundreds or even thousands more books, MP3s, Audible audio books, and other files on the device if you purchase an optional SD memory card (only capacities up to 4GB are supported, as it doesn't accept SDHC cards). We would have preferred if the SD-card slot wasn't hidden behind the Kindle's back cover, but there are worse sins. On the other hand, the battery is user-replaceable--one user-friendly feature that the vaunted iPod hasn't yet seemed to master. The SD slot allows you to expand the Kindle's onboard memory. As we said, side by side, the Sony Reader comes out the clear winner in the looks department and Sony's done a much better job with its protective leather cover (the Kindle's cover seems a bit bulky, and the device just didn't sit inside it that well). Partially due to the clunky cover, the Kindle isn't as comfortable to hold in your hand as the Sony and some folks may prefer removing the Kindle from its cover while using it, though making sure your $400 investment is properly protected is a concern. Naked may not be the way to go. Because of the Kindle's distinct design, people's first reaction to the device tends to be, "Wow, that's cool--what is it?" However, some of that initial cool factor wears off after about a day or two. The Kindle's far from ugly, but it does have an ungainly side to its design. With its built-in keyboard under the screen, the device is most often compared to an oversized Blackberry--and a white one at that. It should also be noted that the Kindle feels a little cheaper in-hand than the Sony, partially because the Kindle's shell/casing is made of plastic while the Sony's is made of metal. We liked the Kindle's button layout, particularly the inclusion of a rubberized scroll wheel and the placement of the large buttons on both sides of the screen for paging forward and back between screens or pages (you can use either hand to page forward or back). However, it is worth mentioning that the next/prev buttons are right at the edge of the device and are almost too sensitive--on several occasions we found ourselves accidentally hitting a button and ending up on another page. Also, the little scroll wheel seems prone to picking up lint, fibers, and other particles. How this will affect operation over time is hard to say, but it would probably help to try to keep it clean. We applaud Amazon for including a home button. Click it and you'll be taken to the main list page of all your content. With a click of the scroll wheel, you can then choose to sort by author, date, or title and to show just books or periodicals (you can download newspapers, magazines, and blogs). You can bookmark key passages of what you're reading, and (using the keyboard), make, edit, and export notes. The Kindle also saves your place when reading anything, so you can always pick up where you left off. We also liked how when you're in a document, you can look up a word in the dictionary by selecting the line from the text using the scroll wheel (the dictionary looks up all the words in the line, so you don't have to go to the trouble of selecting the exact word). On a more critical note, we had some trouble using the "location" jumping feature, mostly because we couldn't figure out what the location description numbers on the screen actually referred to. Use the built-in keyboard to make notes. Much of the aforementioned functionality is similar to what the Sony Reader offers. But the two devices start to diverge once you start talking about the Kindle's wireless capabilities. As noted, there's a built-in EVDO radio that connects to a data service (Whispernet) that Amazon's apparently built on top of the Sprint data network. That limits the device's wireless roaming capabilities to CDMA territories, so don't expect your Kindle to have online access on your next trip to Europe (and most other countries outside the U.S.). That said, you can "manually" transfer content to the Kindle when you're abroad by downloading content from the Web to your PC, and then transferring it to the Kindle via USB. (If everything goes well for the Kindle here in the U.S., perhaps we'll see a GSM version for European customers). Downloading books wirelessly to the Kindle is generally a very pleasant experience. You can search for titles or authors in the Kindle Store or scroll through the national and Kindle bestsellers lists (Amazon is currently offering more than 90,000 titles, including 90 percent of the current New York Times bestsellers). Hardcover bestsellers and newly released titles are currently priced at $10, and you'll see some better deals on paperbacks and other older books. You can download a free excerpt from the book (the first chapter) or simply click on the buy button to purchase the book. In fact, the process is so simple, the first time we hit "buy" we expected some sort of secondary step (such as, "Are you sure you want to buy this book?"). But with one click the book was bought and being readied for delivery (it takes about a minute to download a standard length book). The good news is if you make a mistake, Amazon makes it very easy to cancel your order--and you'll get a message to your Amazon account's e-mail address letting you know your order was canceled. Also, Amazon keeps track of your purchases, so you can delete the file on the Kindle (to make space for more content) and then download it again later for no additional charge. Amazon has made a big deal about being able to subscribe to The New York Times, Washington Post, and several other newspapers and magazines (dailies are automatically delivered overnight, ready for reading on the morning commute). But the subscription to the Times, for example, costs $13.99 a month or $.75 an issue, which may seem pricey to those who are used to viewing the same content on the paper's Web site for free. The same goes for subscriptions to "free" blogs, which run you a buck or two a month. Yes, you can access those blogs from the Kindle's limited Web browser, but it offers no color, Flash support, or even proper formatting--the CNET home page, for instance, was rendered as 18 separate pages. What you're paying for is the automatic delivery and a format that fits the screen properly. But what you're losing, in addition to the subscription fees, is timeliness: with only a single "delivery" per day (for the dailies), you're locked into one version of the day's news--basically, the morning paper. And in today's on-demand world, being stuck with what's effectively yesterday's news is a real throwback--don't expect the latest sports scores, stock quotes, and breaking news. A variety of top periodicals can be wirelessly delivered to the Kindle--for a price. We're not going to knock Amazon too hard for its pricing on books at this point, but it's clear that $10 is still too much to pay for an electronic book, and ideally Amazon would move toward some sort of subscription rental service a la Netflix. Unfortunately, Amazon is handcuffed by publishers who charge upward of $10 for electronic versions of their books, but we expect--or at least hope--to see that pricing evolve with time. We also hope that Amazon will do more to promote cheap content, such as offering Ebook Classics with the purchase of the device as Sony does, or serve up some free content, like Apple does with its free downloads of the day in its iTunes Store. In that vein, Amazon has launched something called the Digital Text Platform, which makes it very easy to upload your own manuscript or document to the Kindle Store and have it converted into a Kindle book. You can then put whatever price tag you want on the book and sell it on the store. Obviously, such a platform should appeal to fledgling authors and has the potential to revolutionize the self-publishing industry, which has seen a rapid expansion in recent years. What else? Well, we should probably mention that the Kindle can access Wikipedia, which technically makes the device a hand-held encyclopedia. Like the Sony Reader, the Kindle is compatible with a number of file types, but most files have to undergo a conversion in order for the device to recognize the files. You can convert files in one of two ways: you can either send attachments wirelessly to the device's personal e-mail address, which will cost you $.10 per attachment. (You create a whitelist for acceptable addresses, so you can't have your bill run up by spammers.) Or you can send them to a "free" Kindle e-mail address that you access via your Windows or Mac OS computer and then transfer the converted files to your Kindle manually via USB (it appears as a drive). According to Amazon, to reduce wireless charges, your best bet is to zip up a bunch of files in an attachment, then send the ZIP file wirelessly to the Kindle's personal e-mail address, where the ZIP file will automatically be unzipped and the files converted. PDF files can also be converted and viewed, but like with Sony's Reader, they won't necessarily display properly because the PDF is scaled to fit the screen. You can increase the font size of Word documents but you can't zoom in on PDF files, which can makes them hard to read because they're being reduced to fit on the screen. PDF's take several seconds to load (as they often do on a computer). Also, one image-based PDF we tried (an architectural floor plan) wasn't viewable at all. In terms of audio, the Kindle plays back MP3 files, so you can listen to music while you read (there's a headphone jack on the bottom of the device along with a tiny speaker on back of the device), as well as Audible books. The device is capable of viewing image files (JPEG, GIF, BMP, PNG) but they, too must be sent through the e-mail conversion process. The pictures are monochromatic--and they look like some really detailed Etch-a-Sketch work--but the effect is kind of cool, and you can use the reader to show off your family album if you're so inclined. As for battery life, you can obviously do better by turning off the wireless connection. Amazon says that if you leave the wireless on you'll have recharge approximately every other day--and our tests confirmed that. Turn the wireless off and Amazon says you can read for a week or more before recharging. The device fully recharges in 2 hours, and unlike the Sony, the device ships with an AC adapter. If all this sounds like a lot of features to pack into a device, it is, and the Kindle is certainly ambitious. The product is three years in the making and to a large degree it shows. At the same time, like we said when Sony put out its first-generation Reader, there's plenty of room for improvement. While Sony may have a leg up in design, Amazon has the critical advantage of having a decent content delivery service integrated right into the device. When all is said and done, that additional functionality makes the Kindle the more compelling device and probably worth spending the extra $100 on. Still, there are plenty of areas that could be improved. Native file support--so you could dump all your Word docs, PDFs, and image files on an SD card without dealing with Amazon's e-mail conversion process--would go a long way towards realizing the promise of a true "electronic book" and not a proprietary "Amazon reader." Likewise, adding a convenient RSS reader so you could pick and choose your own free Web content--not Amazon's list of pre-approved pay-per-view sites--would be a worthwhile addition as well. While we're outlining improvements, of course, we'd like to see the Kindle (and Sony) cost closer to $200. Of course, early adopters are used to paying a couple of hundred bucks extra to be on the cutting edge. And if that's where you want to be, the Kindle's where it's at, impressive and imperfect as it is. The Kindle 3 is Amazon's fastest-selling e-reader to date, the e-commerce giant said today, with more ordered in the first four weeks of launch than any of the previous Kindle models. The first shipments of Amazon's much-anticipated third-generation device also started shipping to customers today, two days earlier than expected. The new Kindle features a smaller build and a screen that Amazon says has 50% better contrast than previous models. A WiFi-only model sells for $139 and a 3G model sells for $189. It's not clear how many of the Kindle purchases were new customers or upgrades to older models. If the Kindle is good, a bigger Kindle may be even better. So hopes Amazon founder Jeff Bezos, who announced the new Kindle DX on Wednesday. The Kindle DX, a digital reading device, is lighter than a thick fashion magazine, easier to read on than a laptop and capable of storing 3,500 books. On the Kindle DX, as on the smaller version of Kindle, readers can download daily editions of major newspapers. Bezos says that feature is already a big hit with Kindle owners. "People love the fact that they wake up in the morning and their newspapers are already automatically downloaded onto the device while they sleep," Bezos says. "They love the fact that if they travel, the subscription travels with them. With the Kindle DX and the larger display, newspapers look even better." And several major newspapers are preparing to test Bezos' optimism. In a pilot program, The Washington Post, The New York Times and The Boston Globe — the last two are owned by the Times Company — will subsidize the $489 cost of the Kindle DX for selected subscribers who commit to a long-term subscription. The New York Times generates the most subscriptions, but it is estimated to be in the low tens of thousands. Neither Amazon nor The New York Times would release figures of how many electronic newspaper subscribers they have. Newspapers are losing paying subscribers of print editions at an alarming rate, and most have notably failed at charging for content online. But Sarah Rotman Epps, an analyst with Forrester Research, says media executives hope to change that. "Newspapers see e-readers as their last best hope," Epps says. It remains to be seen if Kindle can keep hope alive. Amazon boasts a library of more than 630,000 books, while B&N says it has more than a million. Beware of those figures, though, as many of the B&N books are older, public domain books available for free on both platforms. Amazon does not include those books in its tally. Some authors have been coaxed to sign exclusivity agreements with one store or the other (only Amazon has the most recent Salman Rushdie novel, for example). So it's smart to go online and do a spot check of your favorite authors before committing to an e-reader. It looks like the online-only policy is simply a way to manage supply issues at the beginning of the Nook’s life. In a curious case of inverting expectations, Amazon and Barnes & Noble are switching roles. Last week Amazon announced that it would begin same-day shipping in some large cities, in an effort to further marginalize brick and mortar stores. Now Barnes & Noble is squandering a major advantage over Amazon — its retail outlets — by only offering the new Nook e-reader online. Given that the only reason to actually buy from a store is to get the goods right now, this seems rather foolish, especially as one of the Nook’s big features is that you can read e-books for free whilst in a B&N store. We’re assuming that this isn’t policy but pragmatism: It’s likely that the Nook will only be available in limited numbers at launch, and spreading them thinly across retail outlets is probably worse than just shipping them. What’s funny, though, is that this shows up the inefficiency of the bricks and mortar model compared to Amazon’s rather slick online-only operation. There’s an irony in there somewhere. Here's a big advantage for Nook: While using one inside an actual B&N store, readers can browse and read entire books for free. Another perk on Nook is the ability to lend most books to a friend. Readers can send a book to a friend's Nook for up to 14 days. The Kindle includes the option to have a book read to you. That's an important consideration for those with poor eyesight -- or if you just like being read to. Because the real goal for retailers here is to sell you e-books, not e-readers, Amazon and B&N have gone to great lengths to make sure you can read purchased e-books on any device you'd like. Both platforms have free dedicated apps for the PC, Mac, Android-based smartphones and the Apple iPad, iPhone and iPod touch. Books read on each device will automatically hold your place on all the others. Pre-orders for the Kindle 3 have been so brisk that Amazon has had to push the ship date from Aug. 27 to early September. New orders will be filled on a first-come, first-served basis online. The Nook is available now, both online at bn.com and at B&N stores. When Barnes & Noble announced a $60 price drop to $199 for the 3G Nook this summer, Amazon announced a new price for the Kindle -- $189 -- just hours later. When the Kindle 3 is released next month, it will be the new price champ at $139 for the WiFi-only model, but don't expect it to hold that title long. Especially as we approach the holiday shopping season, there's no telling how low these e-readers will go. Could This Be the Eve Of the Kindle 3? It seems that all Kindle orders have been frozen and, it seems, that Jeff Bezos is hanging around New York right now and will speak on Charlie Rose tonight. While I seriously doubt that Bezos will whip out the Kindle 3 on the Charlie Rose show (he’ll probably talk about ebooks outselling hardbacks) it seems there is definitely something afoot. There have been multiple reports that Kindle sales are stopped and if you go to Amazon right now you’ll notice the Kindle – not the Kindle DX – is out of stock. Kindle is probably Amazon’s hottest selling product so for them to put a hold on it is akin to Apple putting up the “The Apple Store is Down” sign. Thoughts? What could Amazon do to improve the Kindle?